Coconut water – Okay, the word “water” is in the title and when you see “coconut” you might initially think mixed drink. However, this healthy refresher has natural electrolytes and a lot of magnesium. It is delicious and a great alternative to sugary drinks. Pomegranate juice – Antioxidant-rich, pure pom juice packs a punch. Drink the non-sugar added pom juice and you have found the complete antithesis to “boring” water. For maximum benefit (and lowest calories), squeeze your own with fresh pomegranates. Green tea – Hot or cold, green tea is good for reducing inflammation, detoxifying the body and is full of antioxidants. This popular beverage is easy to make. 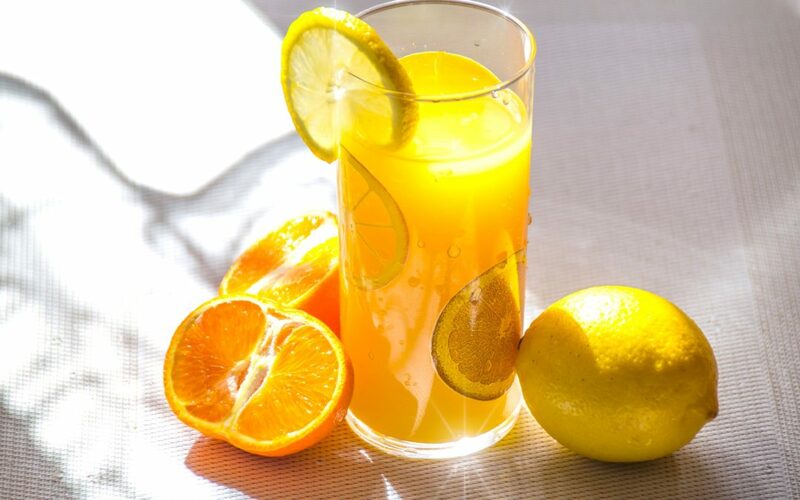 Orange juice – Some people only equate orange juice with breakfast or its vitamin C to combat colds and flu. However, oj is good for seasonal allergies as well. Cranberry juice – Delicious and tart, cranberry juice has often been used to ward against urinary tract issues. If you haven’t, personal testimony says it works. Similar to orange juice, cranberry juice has a higher sugar content than other juices, so drink sparingly. Ginger tea – Great for stomach upset, indigestion and motion sickness, ginger tea is great with some honey. A perfect warm drink that has been used for generations. Tomato juice – Lycopene-rich tomato juice is a super-powered antioxidant. If you’ve only ever had tomato juice in that beloved breakfast cocktail, it might be time to try tomato juice as a stand-alone beverage. Hot chocolate – This one seems too good to be good to be true. If you’re heating up a common grocery-store version, you might be loading up on sugar and calories. To live the fairytale, mix low-fat milk or water with a spoonful of cocoa powder or dark chocolate powder. You might have to try this combination a few times (Yay!) to get the flavor that you want. Remember that the darker the chocolate, the less sugary it tastes (and is healthier). Beet juice – This one might be a tougher sell, but beets are really healthy. Not known for being the most sought-after, beet juice is good for lowering blood pressure because it helps increase the flow of blood to the brain. It has a lot of calcium, iron and magnesium.